National Lampoon&apos;s irreverent and slapstick comedy "Animal House" was filmed in the Eugene, Cascades & Coast region in the late 70s. Today, this both hilarious and present-day politically-incorrect movie has become a cultural centerpiece in Eugene. Singing "Shout" has become a beloved football tradition. And in 2016, Nike released a must-watch YouTube recreation of the "Shout" movie scene featuring a long list of accomplished Duck athletes and alumni. 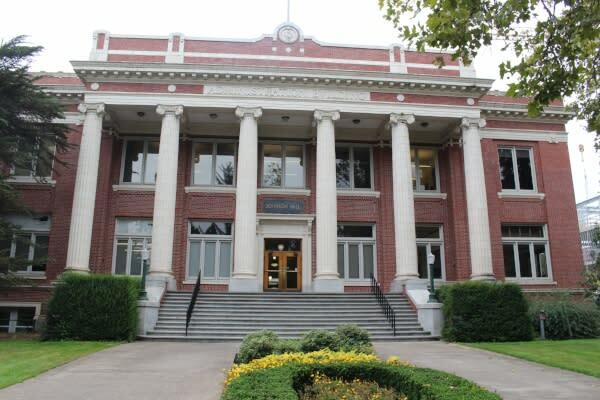 While many of the original film sites around the University of Oregon campus, Cottage Grove and Lowell have morphed into modern environments, some are still easily identifiable and fun to visit. Relive the infamous scenes from "Animal House" on the University of Oregon campus using the UO&apos;s "Animal House" map. Remember when Flounder brings the horse into "Dean Wormer&apos;s office"? That is really Johnson Hall. This historic building from 1915 still houses administration offices, including the office of the president. And the "Emily Dickinson College" where Otter picks up four dates with a phony ploy of bereavement - that is actually Gerlinger Hall, built in 1919 as a facility dedicated to women. 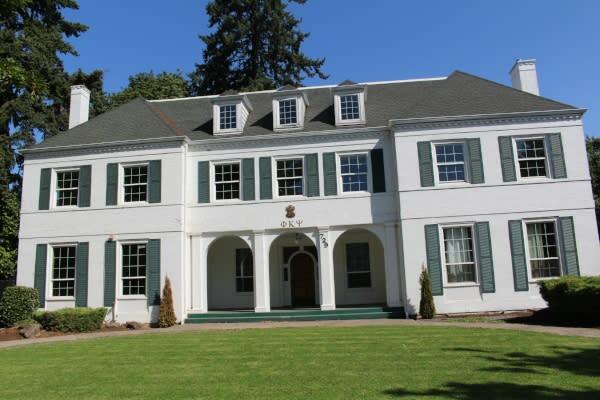 Gerlinger Hall was refurbished in 2016 to preserve the historic exterior and convert interior spaces into studios, meeting rooms and recreational spaces. You won&apos;t see much of the original EMU "fishbowl" where the food fight happened nor the Hayward Field grandstands where Bluto spied on the cheerleaders, as both those sites have been extensively renovated. But you can still check out Carson Hall, Flounder and Pinto&apos;s dormitory, and the dorm kitchen where a golf ball splashed into a pot of soup. Along East 11th, between Hilyard and Alder Streets, are the film sites for the pretentious "Omega House," the decrepit "Delta House" and the "Pi Pi Pi Sorority House". The "Omega House" belongs to the present-day Phi Kappa Psi fraternity and is still lived in. But all that remains of the "Delta House" is an onsite plaque. The building used for the filming was torn down in the 80s. The "Pi Pi Pi Sorority House" - once the Sigma Nu fraternity - is now owned by the Northwest Christian College. The homecoming parade took place on the Main Street of this "All America" town. 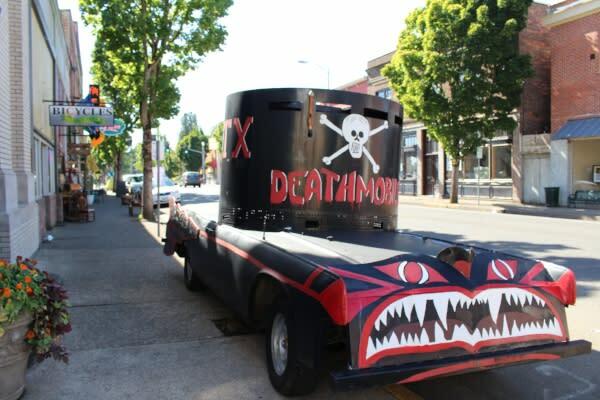 Cottage Grove still pays tribute to parade scene&apos;s chaos with its replica Deathmobile and record setting toga parties. 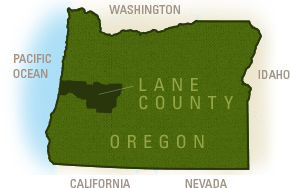 As you explore Cottage Grove you may recognize sites from other movies, as this charming town has been the backdrop to Hollywood sets since the silent film era. Just 20 minutes from Eugene is the Dexter Lake Club roadhouse still sporting its neon sign. This is where Otis Day & the Knights were performing when the "Delta House" members rolled in with their dates. 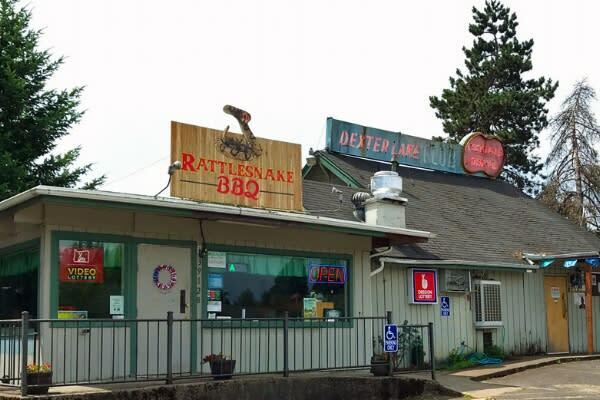 Now called the Rattlesnake BBQ, this famous cafe is a must stop directly off Highway 58 across from beautiful Dexter Lake in Lowell. You can still catch live local music here on special event evenings. The Los Angeles Times explores "Animal House"